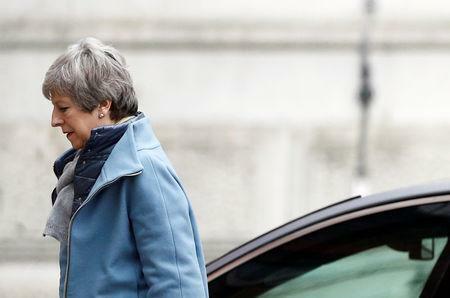 LONDON (Reuters) - British Prime Minister Theresa May is facing a full-blown cabinet plot to remove her and 11 cabinet ministers have said they want her to resign, The Sunday Times's political editor said. "A full blown cabinet coup is under way tonight to remove Theresa May as prime minister," Tim Shipman said. Shipman quoted one unidentified cabinet minister as saying: "The end is nigh. She will be gone in 10 days." May's de-facto deputy, David Lidington, is one contender to be interim prime minister but others are pushing for Environment Secretary Michael Gove or Foreign Secretary Jeremy Hunt, Shipman said.